Do you want to take on a physical and mental challenge to raise money for Noah’s Ark Charity, bond your employees and clients and achieve something extraordinary? 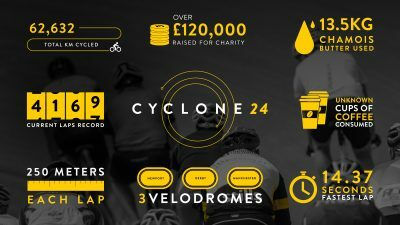 The highly anticipated Cyclone 24 will be taking over the Newport Velodrome between October 21st and October 22nd 2018. To take part you will need a team of 6 – this can be colleagues, clients, friends or a mixture of all. 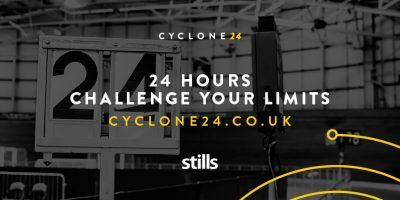 As a team you will take it in turns to cycle for 24 hours from Sunday lunchtime, through the night and into Monday morning. Once registered you will be invited to a private track induction and training sessions. You will be given expert guidance, advice and support both before and during the event. Whether you are a beginner or you are a highly experienced cyclist, if you are up for a challenge, then this could be for you! On event day the following will be provided for you: Exclusive venue access, bikes, helmets, electronic lap counters, mechanical support, physio support, fully qualified track coaches and guidance, refreshments, free parking, free entry for spectators and finishers medals. Special prizes are awarded for the team who cover the furthest distance, the corporate team who cover the furthest distance (4 or more in the team from one business), the team with the best kit. Team entry is £900. To enter simply complete the registration form and return it to Cylone 24, along with your team deposit of £300. If you do take part in the event, Noah’s Ark Charity simply ask that you raise as much money as you can to support the 73,000 children, from all across Wales, who receive specialist and life-saving treatment at the Noah’s Ark Children’s Hospital in Cardiff each year.